Rupali Meshram's claims of fighting off a tiger have been denied by a forest official, who says it was probably a leopard she defended herself against. Either way, the brave young woman managed to fight off a big cat using just a stick. Nagpur, Maharashtra: A 21-year-old from Maharashtra's Bhandara district says she fought off a big cat with just a stick. After the attack, she took a series of selfies of her bloodied face and even posted some of them on social media. Though the terrifying incident took place on March 24, it was widely reported only earlier this week. Rupali Meshram, a commerce graduate who lives in Usgaon village, told PTI she ran out of her house around midnight after hearing her goats cry out in pain. "I heard our goats bleating around midnight, and went out into the shed where we keep them to see what was the matter," Ms Meshram said. There she saw three goats lying dead in a pool of blood. Before she could comprehend what had happened, the big cat which had reportedly killed the goats attacked her as well. Ms Meshram, who maintains that it was a tiger that attacked her, told PTI she picked up a stick to defend herself and called out to her mother for help. When her mother rushed out to help her, the animal attacked her as well. Somehow, Ms Meshram's mother dragged her injured daughter into the house and closed the door. She then made a panicked call to a relative who alerted the forest department. "I thought my daughter was going to die," Ms Meshram's mother Jijabhai told BBC. Once safely inside, Ms Meshram took a series of selfies of her bloodied face. Two of the photos, posted on Facebook, show streaks of dried blood on her face. Her pink T-shirt too is soaked in blood. 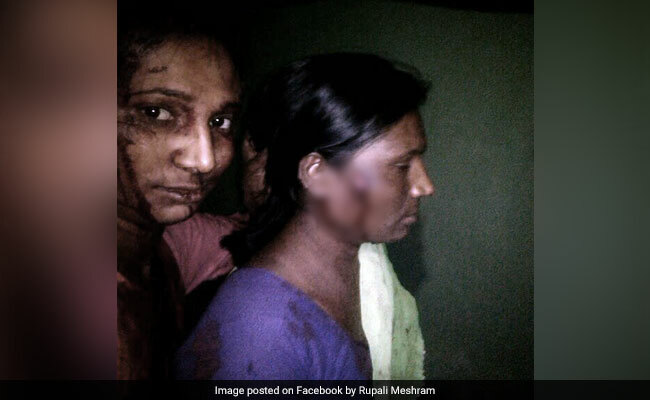 In one photo, Ms Meshram stands with her mother, who has a fairly deep looking gash on her cheek. Forest officials first took Ms Meshram to a hospital in Bhandara and later in Nagpur. A doctor who treated her at Nagpur's Government Medical College and Hospital praised her "exemplary courage" in fighting off the big cat, reports BBC, and said she was lucky not to have been bitten by the animal. Ms Meshram is currently recuperating after receiving treatment for injuries to her head, legs and waist. Her mother's wounds too are healing well. But nearly two weeks after the horrific attack, Ms Meshram has complained that other than reimbursement of expenses of medical treatment in Bhandara, she has not received any financial help from the forest department. She alleges her mother was forced to sell off some jewellery to raise money for the treatment. Vivek Hoshind, Deputy Conservator of Forests, Bhandara said that the department paid Ms Meshram Rs 12,000 and further compensation would be awarded once all formalities such as obtaining doctor's certificate were completed. The department has also refuted Ms Meshram's claim that it was a tiger which attacked her. Instead, Mr Hoshind said it was probably a leopard. "Pug marks of a leopard were found in the vicinity," he told PTI. "Besides, there was no tiger movement recorded in that area."